Negate all Spell effects on the field. Once per turn, during the Standby Phase, you must pay 700 LP (this is not optional), or this card is destroyed. Imperial Order remains a viable Side Deck and Main Deck card even though it was originally from Pharaoh’s Servant. Locks out and locks down all spell cards for 700 per Standby Phase. If you can’t pay it, it is destroyed. Changing it from a non-optional effect to a mandatory one was thought to hurt the cards playability, but LP don’t mean as much now as they used to. This card cripples Sky Striker, Pendulum and True Draco decks, and, while it may hurt your deck, if you don’t run one of these, and are facing one of these, you may take the loss to hurt them more. Not much else to say about this card. It’s great, it still is great after all these years. 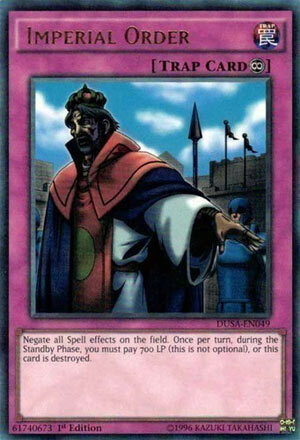 I know Secret Village of the Spellcasters could of been a fitting Throwback Thursday, but I do want to look at Witchcraft upon their release so I’ll save that card for Witchcraft if we do get to it, but reviewing a Trap did make sense as well, so I chose Imperial Order. Imperial Order is a Continuous Trap that negates all Spell Cards on the field and once per turn, during each Standby Phase, you have to pay 700 LP (this isn’t optional) or Imperial Order is destroyed (which is when you don’t have 700 LP to pay). The biggest stinger in the cost is that you have to pay it, meaning if you have exactly 700 LP left, you lose the duel. That scenario is rare, so it isn’t that bad. Imperial Order currently sees itself limited after receiving an errata, cause originally you only paid the cost on your Standby Phase and it was optional, which was too good for shutting down your opponent’s Spells while you could just use yours when you wanted to, so they gave it an errata to make the cost not optional and just to be safe they made it have to be paid on each turn instead of just yours. The errataed form is so good still in decks not reliant on Spell Cards and it can hurt a deck like Sky Strikers since they heavily rely on their Spell Cards and it can sometimes hit combo decks to stop their extenders like World Legacy Succession or Monster Reborn, but the errata made it to where you can’t just throw it in any deck as there are still decks that aren’t reliant on Spells that would appreciate being able to use them. I’m sure you’d like the Pendulum Effects of your Pendulum Monsters if they have any. Imperial Order is a great Trap card in the right decks, which does include Altergeist when you don’t have Secret Village of the Spellcasters, it just isn’t staple anymore since you can’t really control when you get rid of it. Art: 5/5 Part of me just really likes the art of some old school cards, Imperial Order is one of those cards (looks great in the Duelist Saga Ultra Rare, as that rarity typically does, but that isn’t being factored into my grading here). Anywhodlidoodle (in my best Ned Flanders voice) Imperial Order IS still a good card, even with the forced payment. Still appropriate to be a Limited card also, I mean, as someone old enough to have used and abused Imperial Order to destroy it when I chose, and not be able to now, yea, I’m a little sour about it. But that doesn’t take too much away from its overall power, to be honest. As good as this is, with things like Pendulums around, you can’t just throw Imperial Order in your Deck and hope it works out for you. You can’t free it up and destroy it to use your own Magic cards or Pendulums, so Imperial Order has become a crafty, thinking mans card, and I appreciate that aspect of it. A fine argument can be made in most Decks to use or not. If it fits your theme without (too much) disruption, use it. Art: 5/5 Always rather enjoyed this picture. It’s simple, but it is what it says. This was the first Secret Rare to not be all foil, if memory serves, as an anti-counterfeit measure. Somehow, I find myself available for Throwback Thursday, go figure. Imperial Order is (was) a Continuous Trap Card that negates all Spell Effects on the field. You used to have the option to pay 700 Life Points during your Standby Phase or just destroy it. Now you have to pay 700 Life Points during each Standby Phase or it destroys itself. I think it’s funny that you can self destruct with this card, but the benefits outweigh the risks. Negating any Spell on reaction and then shutting out everything else is really good against a lot of decks. It also might work agains you which keeps it balanced and strategic to play. Imperial Order also follows the Yugioh Trap art trend of WASPy males telling the opponent “no” in various circumstances. I appreciate the consistency.